John lake is reached by running to the extreme end of Last Lake where a small creek allows passage to this little-fished lake. With the exception of the extreme ends and the only large bay on the lake, shorelines are rocky and barren. Select areas have some shoreline cover / weedgrowth, and this is where much of your fishing time should be spent. John Lake is primarily a smallmouth bass lake, and the best spot for a trophy bass is the main lake point at the entrance to the shorelunch / campsite / back bay. 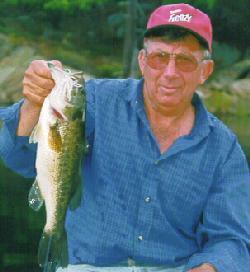 Entering the lake, the shorelines are heavily weeded or rocky, creating excellent holding areas for bass. Both largemouth and smallmouth abound in the entrance narrows and, little fished, will greedily respond to well-presented lures. The “top” end of the lake consistently produces good numbers of smallmouth, but in clear, shallow water, a subtle “finesse” approach works best. Use light tackle, small, natural-finish baits and make long casts. Tiny soft plastic baits usually turn the trick if bass are spooky.